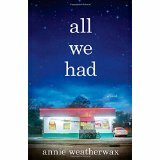 All We Had written by Annie Weatherwax is Rev. Marjorie’s book choice for the month of November. Described by Oprah, who selected it as one of her books: “Fat River, a small town with a ‘thinnish stream”, a gas station and a Walmart, has plenty of eccentric characters, such as a transgender waitress and a disabled Russian gymnast, to name a few. When 13-year-old Ruthie and her mother, Rita, pull off the highway for a quick stop, their only plan is to refuel, steal doughnuts from the local gas station, and keep driving. Instead, they stay and try to go straight for the first time – no men, no cons – which means buying a broken-down house with the help of a less-than-reputable mortgage broker. Part commentary on the sub-prime crisis past, comic novel All We Had keeps you reading. Its small observations, such as why mothers apply lipstick when upset (“There was something about the act of moving the stock of color across her lips that soothed”), as well as its larger, scarier questions about the path to adulthood after a childhood spent simply trying to survive” holds your interest. Plan to read the book in November as we welcome the author to be with us on December 2nd at 7:00 pm at the First Parish of Sudbury to discuss the state of the world, single parenting, and the real life worry of homelessness and survival.